RaceForum.com/Lobster The American Littoral Society promotes the study and conservation of marine life and habitat, protects the coast from harm, and empowers others to do the same. CAN'T MAKE IT? DON'T WORRY, YOU CAN STILL MAKE A DIFFERENCE! 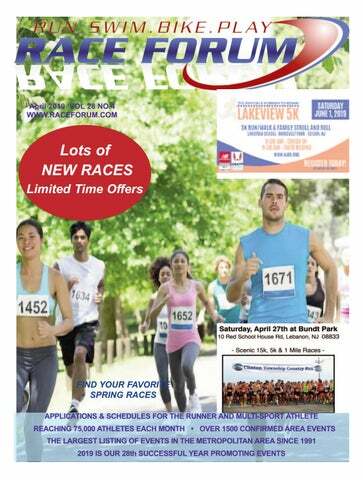 VISIT WWW.CROWDRISE.COM/2019-LAKEVIEW-5K AND DONATE TO A TEAM OF YOUR CHOICE! All proceeds from this event support The Arc of Monmouth’s services and supports for individuals with au琀sm, Down syndrome, and other intellectual/developmental disabili琀es. Send us you club workout shots for the next issue. Send Pics Here Prefer Horizontal Orientation Only best pictures will be published. This is a USATF Sanctioned 5K and all proceeds will go to Nicole’s Heart Foundation. Nicole’s Heart Foundation is a 501(c)3, non-profit organization formed in memory of Nicole Trott, a 2011 SJV graduate. Nicole was a varsity cheerleader, gymnast, and track athlete. At the age of 18, Nicole lost her life to Sudden Cardiac Arrest (SCA) due to an undetected congenital heart defect. Our mission is to bring a greater awareness and provide education about SCA and the importance of cardiac screenings for high school athletes. RUNâ&#x20AC;&#x2C6;WITHâ&#x20AC;&#x2C6;VERONICA June 8th, 2019 Spring Lake, NJ The Run With Veronica Foundation was started exclusively to charitably benefit other worthy organizations or individuals and for promoting education, health and awareness in the area of pediatric cancer through distributions to organizations that qualify as non-profit 501(c)(3). The Run With Veronica Foundation raises income through fundraising and donations. All donations made by the foundation shall be made to other charitable organizations with a preference given to those charitable organizations that specialize in pediatric cancer research and other no-profit, charitable organizations that support and assist families struggling with pediatric cancer. 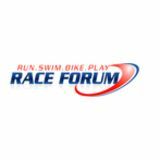 67 issues Promoted digitally through Race Forum Published every month reaching 75,000 plus area athletes. Save $5 with code RFAP19 until 4/30! PRICE INCREASE! October 13, 2019 Clinton, NJ to Flemington, NJ Oct. 12: Expo featuring vendors, entertainment and capped by the Superhero Sprint Kids’ Race! REGISTRATION FEE INCREASES APRIL 14th! Sign up now to save money. Save even more with the discount code!